So you’ve got a folder full of PDF files that you want to print. You hilight all of them and right-click, but there’s no “Print” or “Send to printer…” option. There are probably ways out there to add this option to your right-click menu, but a quick and dirty way is to use the command line using the lpr command. This is useful if you just need to print multiple files once in a blue moon. I mean, how often do you print 5 PDFs at once? Furthermore, how often do you print nowadays? Once you have all the files you want to print hilighted, copy and paste them into a new empty folder. 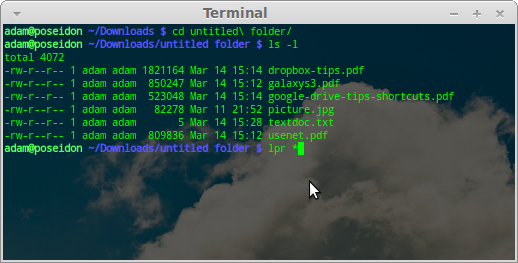 Navigate to that folder via command line/terminal. I have only tested the lpr command with PDF files and it worked perfectly, but I suspect it should work with any file format that your system recognizes. For this reason I assume it should work for office documents, pictures, etc.